Sacramental rite in the Christian Church, preceding the mass or communion service. It appears to be referred to in Rom. xvi. 16, I Cor. xvi. 20, II Cor. xiii. 12, and elsewhere, and is referred to by Justin Martyr ("Apologia," i. 65) and by Tertullian ("De Oratione," 18). F. C. Conybeare (in "The Expositor," 1894, ix. 46) suggests that this practise of the early Christian Church was derived from Jewish ritual, referring for evidence to Philo's "Quæst. in Exod." ii. 78, which speaks of a kiss of harmony like that between the elements, while in another passage (ib. ii. 118) the Word of God is referred to as bringing hostile things together in concord, communion, and the kiss of love. Jellinek ("B. H." vi. p. li.) 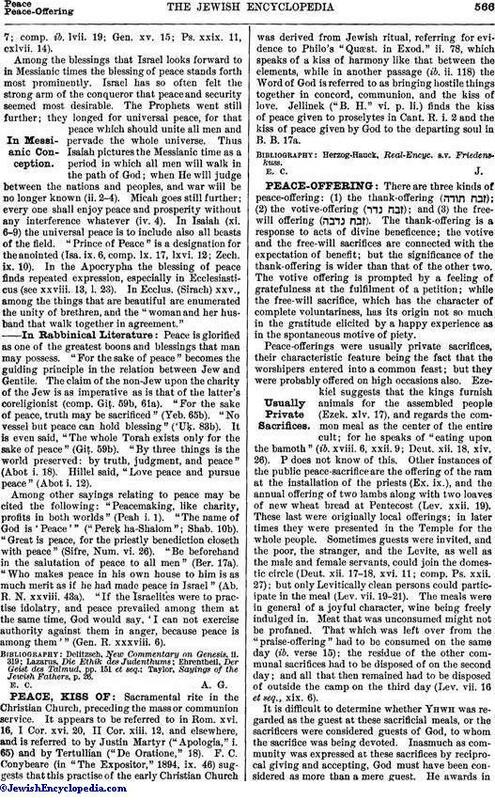 finds the kiss of peace given to proselytes in Cant. R. i. 2 and the kiss of peace given by God to the departing soul in B. B. 17a.